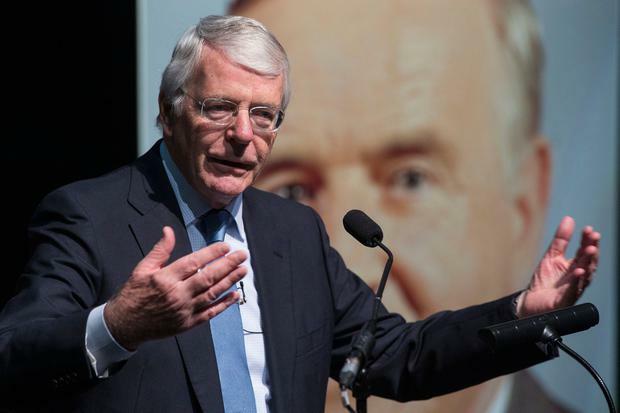 A recent ‘Financial Times’ editorial singled out John Major’s “masterful” handling of the Maastricht Treaty negotiations in 1992 which allowed the UK to stay outside the eurozone while maintaining full access to the single market; it was, of course, intended as a put-down – as if one was needed – of Prime Minister Theresa May’s handling of Brexit. Looking back on that period, however, it is clear that Major was facing a far less intractable problem – he was trying to find a way to stay in, while May is trying to find a way to get out. It is hardly surprising the EEC, as it then was, demonstrated far greater latitude to the UK negotiating position in 1992 than is the case today. Today, Major will address the Institute of International and European Affairs on the subject of Ireland, the UK and the future relationship. He has been highly critical of Brexit (“a colossal misjudgment”), and of Brexiteers (“those that persuaded a deceived population to be poorer and weaker”). The occasion for the address is the 25th anniversary of the Downing Street Declaration, which established some of the founding principles of the subsequent constitutional settlement agreed in 1998. These included the principle of consent and the idea unionists need not be cut off from the rest of the UK and nationalists need not be cut off from the rest of Ireland. Major took enormously risky steps in opening a dialogue with the leadership of the IRA. Taking this into account there are few people better positioned to triangulate Ireland, the UK and the future of Europe. Today’s uncertainty gives us an opportunity to consider what lessons from the past might aid us in better understanding the present. In 1992, Major faced similar problems to those faced by May today. Writing about those Maastricht negotiations in his autobiography, he described the dilemma he faced: “If I reached an unsatisfactory deal I might earn goodwill on the continent, but the Conservative Party would repudiate it, the Cabinet would split, and the agreement might fail in Parliament.” The line could be lifted from May’s diary. Nonetheless, there are key differences between the UK approach to the negotiations in 1992 and the approach being taken by May’s government. For example, in November 1991, the Major government initiated a Commons motion on the negotiating position he would adopt at Maastricht in order to strengthen his hand with the EU. The risk of tying his hands, he decided, was worth taking. His negotiating position was clear. He wanted to stay out of the EMU, oppose the Social Chapter and was in general opposed to a federal Europe. Effectively, these were what might now be referred to as “red lines”. By contrast, Mrs May had to be forced to have a vote on triggering Article 50 by the UK Supreme Court decision in February 2017. Far from leveraging parliamentary authority, she sought to avoid a vote in the first instance and then, by calling a general election in April 2017, to effectively emasculate any parliamentary opposition. Following the successful negotiations in Maastricht, Major won a general election in April 1992, again in contrast to May’s disastrous post-Brexit election. Events conspired to make the passage of the Maastricht Treaty through Westminster in 1993 far more complicated than would otherwise have been the case. In particular, crashing out of the Exchange Rate Mechanism in September 1992 energised Tory rebels. Then, as now, influencing Europe from the inside made more sense than splendid isolation. In his autobiography, Douglas Hurd, the United Kingdom’s foreign secretary at the time, noted that failing to ratify Maastricht would “by our foolishness have helped to bring about the nightmare which had always alarmed our predecessors: a continental union influencing British lives at almost every turn over which we had no control”. It is interesting to look at the playbook adopted by Major’s government in 1993 when trying to steer the Maastricht legislation through Westminster. They also faced an unholy alliance of Tory rebels and a Labour Party that would do anything to unseat the government. The government lost a crucial vote on the legislation in July 1993 by eight votes and the following day the Government tabled an emergency Motion of Confidence which it won by 39 votes, thus snuffing out the rebellion. As we look for clues as to what might happen later on this month, this is one approach which would test the mettle of Tory rebels and the DUP. More than 25 years later, it seems that those early skirmishes were portents for the future. Europe was the issue that soured the later years of John Major’s premiership. Europe brought down David Cameron and there are few who would bet against Europe unseating Theresa May. With the meaningful vote in the House of Commons now postponed, the only certainty we have is Europe continues to be the issue that most divides the United Kingdom’s body politic.